Baking anything in caramel rocks, almost as much as wrapping anything in bacon does. This dish takes a basic french toast idea, simplifies the cooking process and doubles the taste factor. Make it the night before, let it steep in the fridge overnight and then simply pop it in the oven in the morning, leaving you time to put your feet up and enjoy your mimosa. 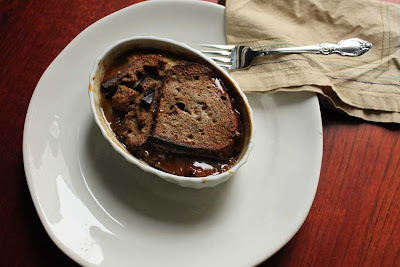 A friend had mentioned this idea to me the other day and it sounded terrific, so I created a recipe, played with the flavor combinations and I have to say- this is pretty terrific! I choose a pumpkin pecan bread from Whole Foods- it was stunning, similar to a hearty Italian loaf but with the flavor of pumpkin and studded with pecans. Absolutely super. 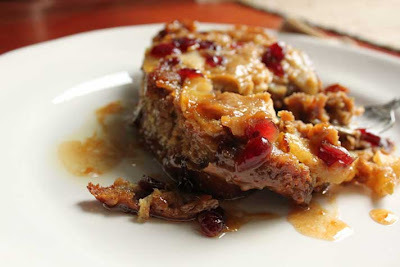 Baked french toast will be a great dish for the holidays, but why not be fat and happy other times times too? Tip and Techniques: Change up the fruit depending on the season - perhaps with bananas and blueberries or pineapple and raspberries- be adventurous. I would also suggest using whatever bread you have on hand as well, don't feel limited to use a pumpkin pecan bread as I did, try a challah or even just a french bread loaf will work great. Also, I made these in individual ramekins- but you can also do one large casserole dish or try filling a muffin tin pan. Melt the butter in a sauce pan, add the brown sugar and bring to boil. Carefully add the cream and whisk until it all comes together. Keep the caramel on a soft boil for about 5 minutes, stirrring once in a while. Set aside. Whisk all the ingredients together, except for the bread. Choose the bread you are using and cut into various size chunks, add them to the egg mixture and press them down in there so they soak up the mixture. Set in the fridge overnight or for a few hours. Clean and slice one apple, in 1/4 inch slices. Toss with a little fresh lemon juice to keep from turning brown. Take the caramel and pour it into a greased pan, ramekin, muffin tin-whatever dish(es) you are using. 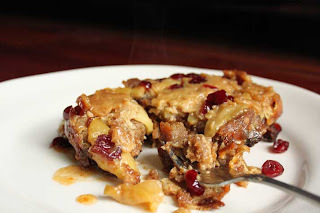 Sprinkle cranberries into the caramel, can use craisins instead of fresh cranberries. Lay the apples onto the caramel in a single layer. Piece the bread onto the apples, and pour any extra egg mixture that didn't soak in right over the bread. Bake in a 400 degree oven until the top bread is crusty and the middle is set. Remove from the oven and let it sit for minute. Carefully tip the pan upside down onto a plate and serve.